An hour ago my wife and I decided to go outside to see how our girl was doing. I was horrified to see a broken egg in front of the nest. It looked like something had torn its way into the egg… but wait a minute, maybe I’m wrong. 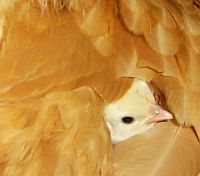 I gently lifted up my hen and to our amazement we saw two tiny little puff balls hiding under their mom’s wing. Upon even closer inspection we saw another VERY new chick that was still very wet all curled up in a ball. Our best guess is that the top two yellow chicks are the Black Tailed White Japanese (from two small eggs I found).Since there are two more small eggs that haven’t hatched I’m guessing the fuzzy thing towards the bottom of the screen is one of the Leghorn / Welsummer chicks.It’s a good thing that I decided to candle the eggs last night instead of tonight and that I made all the changes I did to the coop and ramp yesterday. It is amazing to think that just 20 hours ago we were holding these in our hands as little eggs and looking inside! More bad news: We checked and the little one to the far right of the picture above didn’t make it. So far it seems that we only have one of the leghorn / welsummer crosses left. We hope it’s a girl. 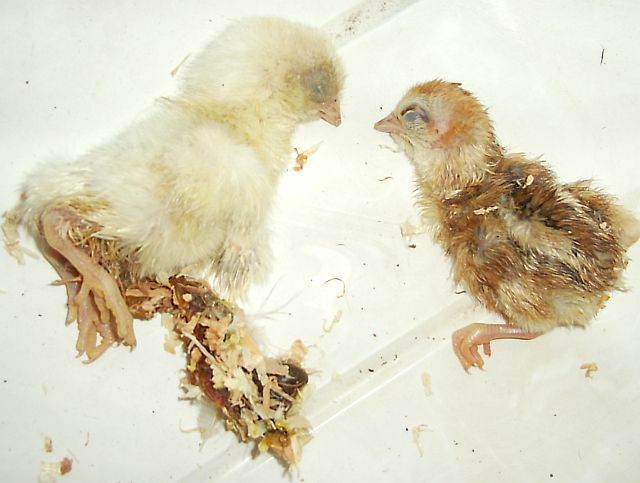 Here is a post mortem picture of the two chicks. One still has the “sack” attached. It is so sad to think that they made it all the way to breaking free of the egg and then died. If we lost them while still in the egg it wouldn’t have been so sad. A really quick update. I’ve found 5 eggs the past 3 days, so either a few girls are doing double duty or my Buff Orpington mother is laying again! I’d love to tell you all about it, but I just hit a wrong key and deleted all that I had typed. enjoyed this so much. im granny, retired to country life and i also enjoy hatching eggs and watching the babys grow. Its so much more fun when the mommy does it than in the incubator, much more success. and much less work. I’ve not tried the incubator but I recently came across one at a garage sale and the price was so good I couldn’t pass it up. Of course, a broody hen seems to be WAY easier than a bator. i have just come across this page, how lovely. i am sitting at home awaiting the arrival of 6 Aruacana eggs, purchased from ebay. i am borrowing a friends incubator and once settled will await, hopefully, my new arrivals. i am a newcomer to keeping chickens, i have six lovely girls, mixed varieties, light sussex, rhode, cuckoo and blue maran. however i fancied some blue egg laying varieties for a change. quite exiting, i have never candled eggs and found your site v ery informative, thankyou, i will keep you posted. 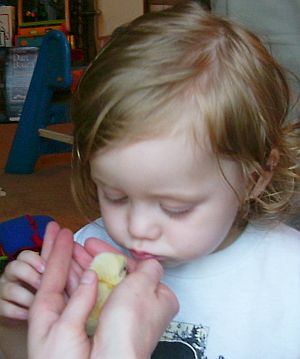 Im 17 and me and my family have been breeding chickies for about a year. We have had 3 sussesful hatches from our hens with 6 chick from our hens and 2 adopted. We have a Light Sussex rooster and Light Sussex and Rhode Island Red hens. About 2 days ago we had two hatch from a bunch of seven. Two we know died coming out of their eggs, and one egg stil remains. Our rooster lives with our hens and so each egg is a potential baby. My dad thinks that the egg that is still there is one that was laid a week after the hen started sitting so I am incubating it with my heat lamp. We have two chicks (a Light sussex and a light sussex/Rhode Island Red cross) that are 5 1/2 weeks old and 2 two day old chicks that look like Light Sussex. My dad has built three diffrent coops for our chickies. One has the rooster, and 6 hens, one a Rhode Island Red hen and the 5.5 week old chicks and one with the Light Sussex hen and the two day old chicks. We also have a bantom hen who was given to us from our neighbours. She is a bully to the Rhode Island Red mum who is the youngest apart from the chicks but is too small to go with the rest. We have her in a tiny cage all by herself. I dont know what is going to happen to her. I just wanted to tell you my story as I read yours. I am going to try the ‘candeling’ on my egg to see if I can see anything. I hope my egg will hatch. Hope your Chickens are doing well. Thanks Jan! My wife and I are wanting to diversify our flock a little with some super dark egg layers. We’ve now got an incubator and may give this process a try in the next few weeks. get, the more I am willing to give the work part of incubating to the younger gals. Continue your good work. To Georgina, don’t forget to turn your egg like “mom” would. Carol, thanks for the kind words! We’re hoping to try incubating using an actual in house incubator next time so our girls can watch the whole process close up! Sandra, I hope you were able to get on! 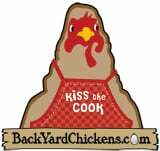 If not, send an email to support@backyardchickens .com and someone should be able to assist you. I just read your article. I loved it and plan to use it to help me. We are going to be hatching out some of our own eggs for my grandson. He is 7 years old and I want to show him how to candle. This will be a very helpful site for me. We are starting today March 22, 2008. I will let you know how it turns out. Thanks for the information. Thank you so much for your wonderful story – I have two silkies and they were each sitting on an egg (not their own – but two adopted bantam eggs). Yesterday one of the eggs hatched into the most beautiful baby but still nothing from the other egg. I did not know how to candle and egg but want to try with this unhatched egg – even though it might be too late – I don’t know when to give up on it so to speak and would hate to throw it away if it might still hatch. Thanks for your story and photos. My chicks will arrive today. I found all of your information quite easy to understand and it really helped me out. The pencil drawing in books don’t quite show how to candle in a way that I could understand. Thanks for being brave enough to post the post-mortem photos. Now I know what to expect if that happens and won’t be unpleasantly suprised. You have saved me a little grace there. Your website is great and easy to navigate. Thanks again for all your help and the extra know-how. I am looking forward to many happy years with my new chickies and their peeps! at 6 o’clock today it will be exactly 21 days since my leghorn eggs have been in the incubator, i have done eveything my the book and i just went outside and looked in but nothing happening as of yet , no cracks , no peeps , what should i do ? Hi ya’ll!! I’m so excited because we just got an incubator from a friend. I don’t mean to put all my eggs into one basket, but we lost a beautiful and much-loved barred rock to a neighbor’s dog. My boys found one of her eggs in the yard and we’re hoping to hatch it. After candelling we can see it’s fertile, though a couple of days old. We’ve collected this egg and about seven others from our other hens and are hoping for some success, since our rooster seems overconfident in his abilities–what rooster isn’t, right? Anyway, I wanted to tell you how WONDERFUL it was to be able to access this site and get information about your own experience. I don’t feel quite as nervous and alone a this point. You candelling info is a life saver and we greatly appreciate it! Hi All. I am now trying to hatch my first flock of chicks. We have been given 4.5 dozon eggs to hatch and they are all in the bator and are scheduled to hatch in about a week to a week and a half. Thanks to your lively and incredible information and candeling pictures, it helped me understand better of what Im doing. Hoping we got some good layers out of these batches. If more then 10 eggs hatch, family members are BEGGING for them! Thank you so much for taking the time to post all of this!! It helped me a lot because I’m not really good with candling eggs, and never really knew what to look for in the early stages of the egg development. I’ve been raising chickens for about 13 years, and normally I would let my pullets/hens sit on their eggs. Unfortuntately only one of my hens is broody right now, my Blue Cochin, and she doesn’t feel like setting on eggs. Funny thing is she’s laying while being broody. Anyways, I currently have 21 eggs from different breeds of my chickens in an incubator that I just started up right now. I’m pretty sure all of them are fertile, but I’m going to candle them in about 5 days after the eggs get some time to develop a bit. Great source of info ya provided here!! I too was uncertain about what to look for when candling,. Being a visual learner, seeing pictures helped me much more than a written description. I’ve been experimenting by allowing my little Banty hen (s) set on an egg. They went broody again after just a few months of being non-broody, so I thought “hey, whattta the heck, giv’m what they want cuz they aint laying”……hahaha. I say the “hens” because the 2 Banty hens are attached at the wing, sorta speak….they dont go anywhere without each other. They’ve been taking turns laying on the single egg. I tried setting up a “delivery room” for just one hen but the other one had a fit, pacing up and down in front of the blocked off area….so I let her in and she went right in the nest with her pal. I guess it’ll be okay since we’re at day 23 and the egg was still intact. I heard little peeps coming from the egg when I moved it………..how much longer til it hatches? Just found the site and really enjoyed the pics and stories. 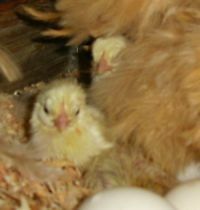 My husband was being funny and when I wasn’t looking put in several tiny Easter chicks in the incubator. When I went to check on them I laughed until my face hurt! I am currently nursing one of my Muscovy ducks (HennyPenny) she had a serious problem passing an egg so I separated her from the rest and she finally passed not one but two eggs and seems to be healing well….Has anyone out there experienced this with any of your hen’s before?? my chicken is sitting on the eggs and its been almost 4weeks will they hatch ??? but theres a duc egg under her along with two chickens eggs and the duch egg is 5 mountes hatch and now we put it under the chicken and if the chickens egg dont hatch will the duck ggs hatch ?????? eggs so I moved her but she ditched the nest. will the chooks look after them??? I am happy for your success. I have dabbled with chickens for about13 years. I have always kept roosters with my hens which are a mixture of buff orpintons, cucukoo marans, americunas, brown rose comb leghorns, and BB bantams both pure breds and their cross/ pure off spring. I have lucked out to by having eggs hatch out both in an incubator and under the hens. Once I installed a double hot wire on tbe outside of my chicken pen to discourage. Dogs, oppussoms, raccons and foxes my survival rate increased. However, snakes and hawks still remain threats to the chicks. I lost 3at to a determined black snake when they were about 6the weeks old. The snake tried to swallow the chick head first, but discovered the body was too big to handle. The snake regurgitated the smothered chick and tried twice more. Unfortunately for the snake I discovered it while the 3rd chick was still in its mouth. I buried all 4 bodies, however, the snake was buried alone not with his victims. I appreciate the post mortum pictures. 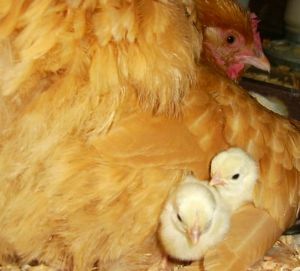 The smallest one looks like I of my bantam chicks. They are easy to die if a standard size hen accidentally steps on them since they are so small. I think that is what might have happened. I the wish you luck in the future. You already know I that once a nest site is chosen getting the hen to chanve is a loosing battle. Now if I could just convience my mama goose to lay her eggs someplce other tban right in front of the peoe chicken coop door. Now she really can put the bite on you.